The Paradise Papers are likely to cause little in the way of direct implications for offshore wealth managers in Asia-Pacific, according to an analyst with GlobalData, a leading data and analytics company. Andrew Haslip, Financial Services Head of Content for Asia-Pacific, says that all the latest release will do is stoke more political appetite for increasing regulatory scrutiny of anyone involved with the wealth management industry. This will likely drive further consolidation in the offshore private wealth space though, as more private banks sell up marginal operations. Yet another large leak of confidential client records has hit the headlines, with the International Consortium of Investigative Journalists publishing the so-called Paradise Papers. The papers are mainly made up of nearly 50 years of business activity by Appleby, a law firm based in Bermuda that specializes in offshore clients. They document a range of legal structures and strategies used by corporate and individual investors all over the world to minimize tax liabilities. Most concern clients in the US and UK but Hong Kong and mainland China form the fifth and sixth largest sources of clients, respectively. As such it is unsurprising the leak shows little in the way of wrongdoing, and unlike with previous leaks wealth managers have little to worry about in terms of fines and direct legal action as a result of these revelations. But in the longer term the papers are likely to contribute to further regulatory scrutiny of the industry and doubtless lead to calls for more legislative action from politicians around the world. The net result is likely to be even more burdensome regulation for those operating in the offshore market and yet more compliance issues to deal with. Haslip adds: “Marginal players in the offshore wealth market are likely to see this as a key milestone at which to reassess their business. 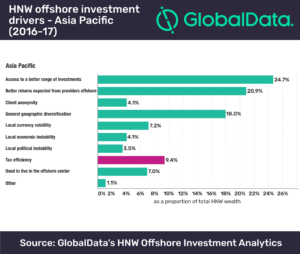 Given that recent years have already seen a number of foreign private wealth managers selling their operations in Asia-Pacific, the Paradise Papers are likely to prompt some reassessment of any small scale offshore operations in Asia-Pacific as well. Analysts available for comment. Please email the GlobalData Press Office at pr@globaldata.com.